When you need to quickly remove a large object from a photograph, the Photoshop Patch Tool could be the solution. In this tutorial, I’m going to explain how you can use the Patch Tool. I’ll also be sharing a few tips to help you achieve better results. 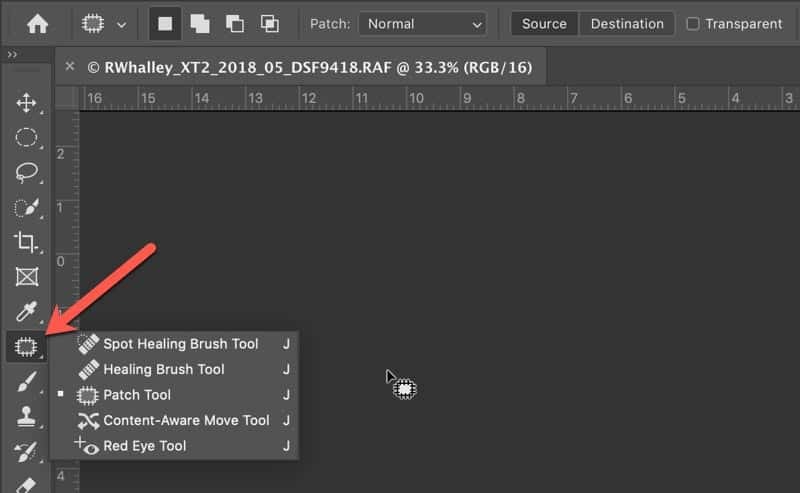 The Photoshop Patch Tool lives in the Photoshop Tools Palette found on the left of the interface. You can see this in the screenshot below. The Patch Tool is part of a group of Photoshop Tools that all have a similar purpose which is to fix problem areas of an image. The other tools in the group are the Spot Healing Brush Tool, Healing Brush Tool, Content-Aware Move Tool and Red Eye Tool. Depending on how you have your Photoshop interface configured, one of the other tools in the group may be visible. If you find the Patch Tool’s hidden, right click on the icon of the visible tool to display the group. You can then click to select the Patch Tool. When you have selected the Photoshop Patch Tool you will see its options in the Context Sensitive Toolbar. You can see a screenshot of this below. This screenshot is from Photoshop CC 2019. Depending on which version of Photoshop, you’re using, you may not see the same options. The Photoshop Patch Tool now has two operating modes. There is the Normal mode and a Content-Aware mode. You select these from the dropdown you see indicated in the screenshot. 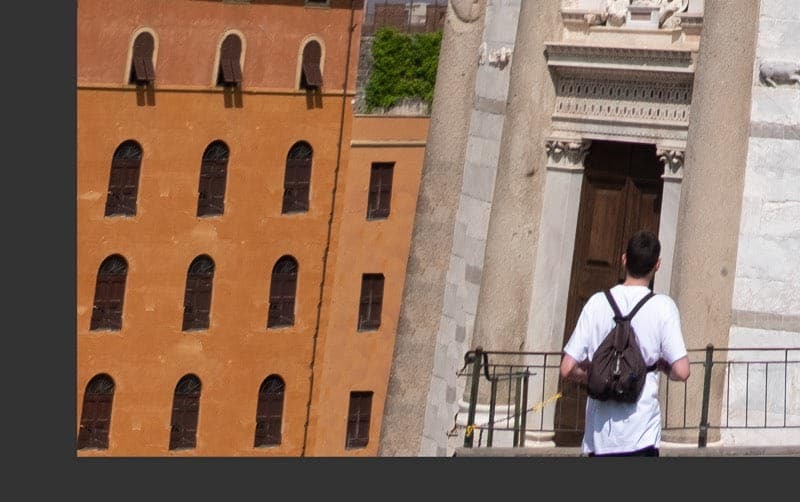 When you select the Content-Aware mode, Photoshop attempts to identify how best to blend the repair with its surroundings. When used in the Normal mode, you’re responsible for selecting the best area to use for a repair. This will play a large part in the quality of the final repair. We’ll look at the different operating modes using the following holiday snapshot as an example (click the image to enlarge). If you look at the lower section of the image you can see there are a few things that clutter the scene. There is a crane to the right of the frame. A bin at bottom right. An Army vehicle at the bottom left of the frame. We will now use the Photoshop Patch Tool to attempt to repair some of these problems. Do keep in mind that the Patch Tool might not be the best option for every repair. It’s also often best to combine it with other tools to achieve a good repair. If you’re using an old version of Photoshop the Patch Tool, it’s a little different to the other Photoshop repair tools. Unlike the Healing Brush and Clone Stamp tools, you can’t use the Patch Tool on an empty layer and sample from other layers. The Patch Tool must sample from and apply the repair to the same layer. In other words, it’s a destructive edit. The best way to deal with this is to create a new Stamp Layer which to use for the repair. A Stamp Layer is a layer that consolidates all the other layers in an image into a single new pixel layer. You can create a Stamp Layer by pressing Shift + Command + Option + E on your keyboard (for a Mac). If you’re using a Windows PC use Shift + Ctrl + Alt + E. But before you do this, make sure that all the layers you want to include in the new Stamp Layer are visible and that you have the top visible layer selected. 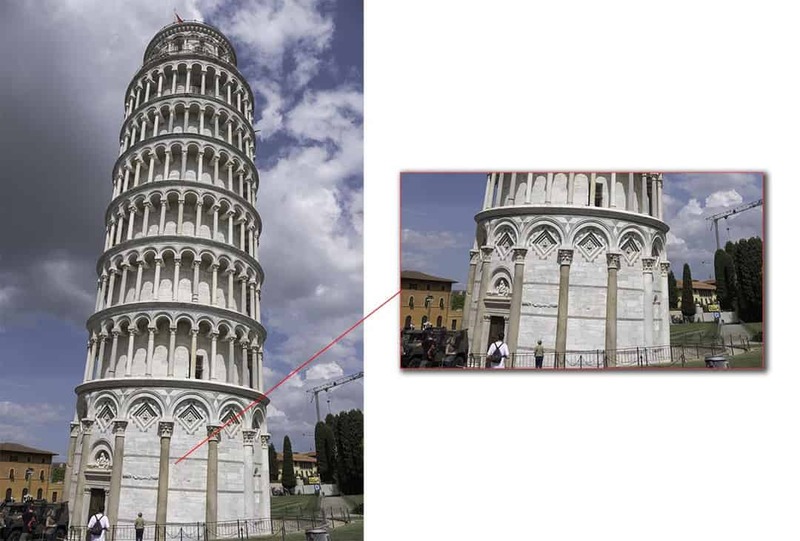 In more recent versions of Photoshop, you will have the “Content-Aware” mode. When you use the “Content-Aware” mode you’ll also see the option “Sample All Layers” in the Context Sensitive toolbar. If you see this, you don’t need to bother creating a Stamp Layer. Just add a new empty layer to the top of the Layers Window and select the “Sample All Layers” option. You can then work on the new empty layer for your repairs. If you’re using the Normal mode for the Patch Tool you will need to use the Stamp Layer approach described above. 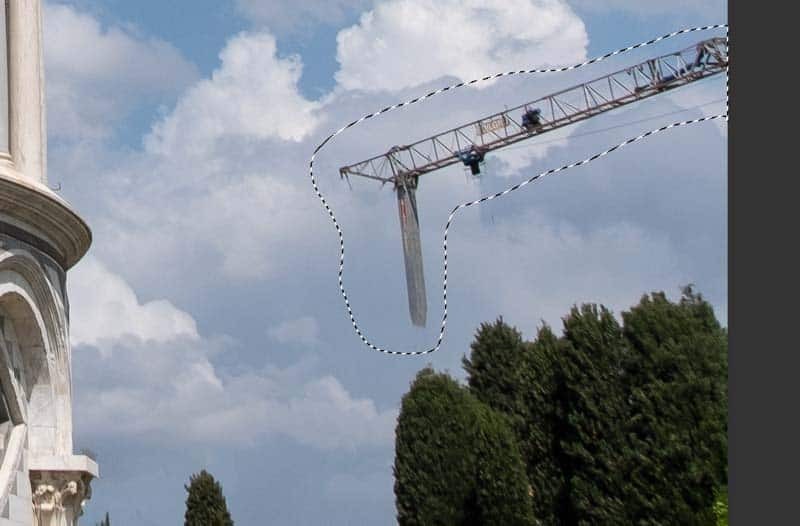 Let’s look at our first example of removing the crane from the right of the frame using the Photoshop Patch Tool. Before you use the Patch tool, consider repairing some of the finer details using the Clone Stamp and Healing Brush tools. These tools allow for much greater precision than the Patch Tool and can help create a better repair. In the following illustration, you can see a magnified section of the image where we are removing the crane. 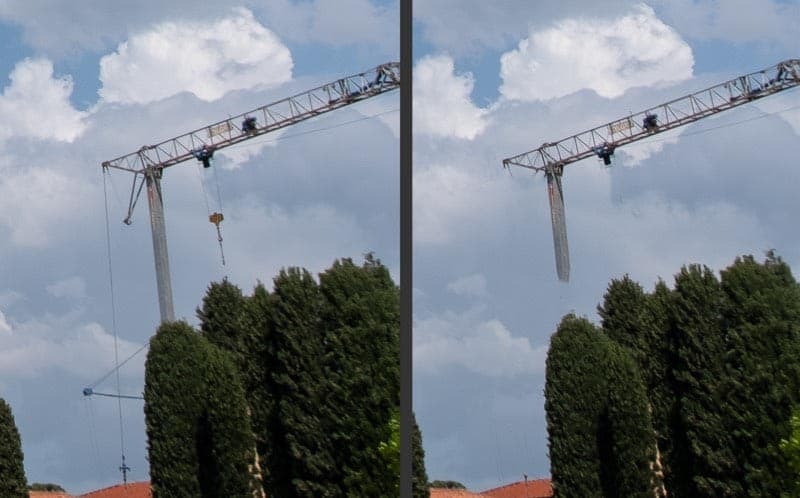 On the left is the original image and, on the right, we have removed some elements of the crane using the Healing Brush Tool. Having removed elements of the crane, we can draw around the remains with the Patch Tool. This reduces the risk that we will affect other parts of the image causing a messy repair. In the following screenshot, you can see the selection made with the Photoshop Patch Tool, around the crane. With the Patch Tool selection in place, check that you have the “Content-Aware” option selected in the Context Sensitive Toolbar. You can then click and drag the selection to select an area to use for the repair. 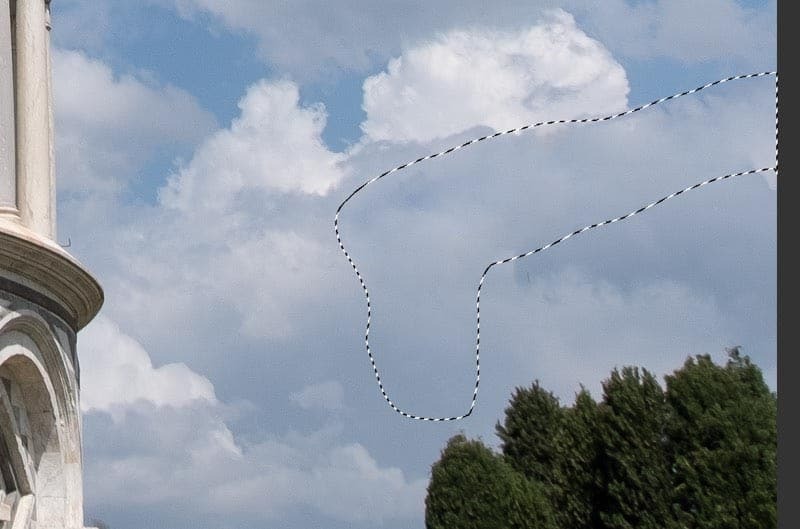 Try to find an area that appears to closely match the area you want to repair, in this example the clouds above the crane. You can see the finished repair after applying the Patch Tool in the screenshot below. I’ve left the selection in place to help visualise the repaired area. I’m sure you will agree that it’s impressive. Our second example will be much more complex than the first but will use a similar approach. 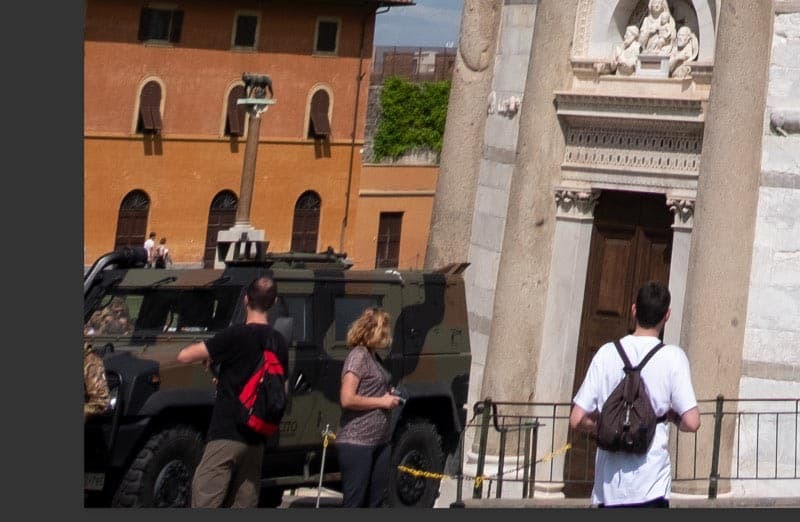 Here we want to remove the army vehicle from the lower left corner of the frame. You can see this in the magnified section of the image below. As before, will start by repairing small areas using the Healing Brush and Clone Brush Tools. The most obvious repair is to the side of the tower. Here you could use the Clone Stamp to copy other areas of the tower over the vehicle to remove it. There’s also a statue behind the vehicle which we can remove to leave just the building. Again, you can use the Clone Stamp Tool to remove this by copying other areas of the building. You can see the results of this repair below magnified at 300%. Here we’ve repaired the edge of the tower and rebuilt part of the building behind. The important part of this preparatory repair is that we now have complete windows (do spend more time doing this than I have here, my repair is a little messy). Now when we use the Patch Tool, we can reproduce sections of the building. This highlights the importance of planning your repair before starting. Draw around the remaining part of the vehicle using the Patch Tool. This time we will be using the Patch Tool in the Normal mode rather than the Content-Aware mode. Using the Normal mode allows us greater control over the repair. In the following screenshot, you can see the repair made with the Patch Tool which has copied the upper windows of the building. Notice how we are making the repair to the building a section at a time. You can see the finished repair below. 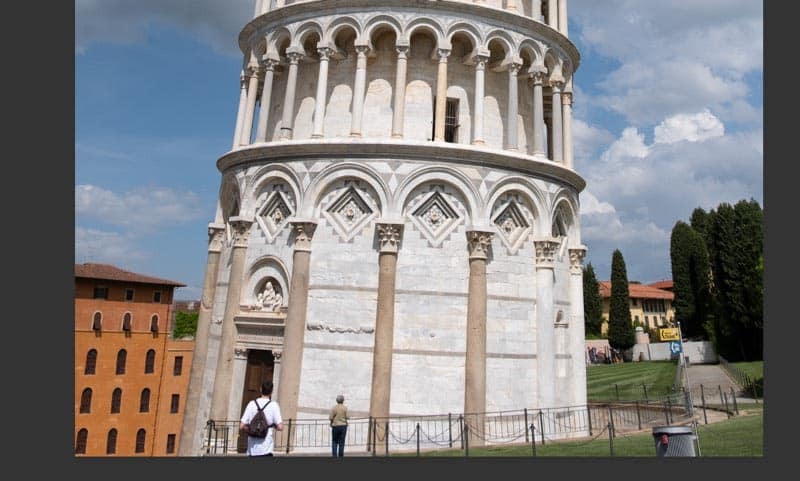 Unless you have visited the Leaning Tower of Pisa, you probably wouldn’t realise the building has only two levels of windows. What you should be seeing in this area is grass and a statue. 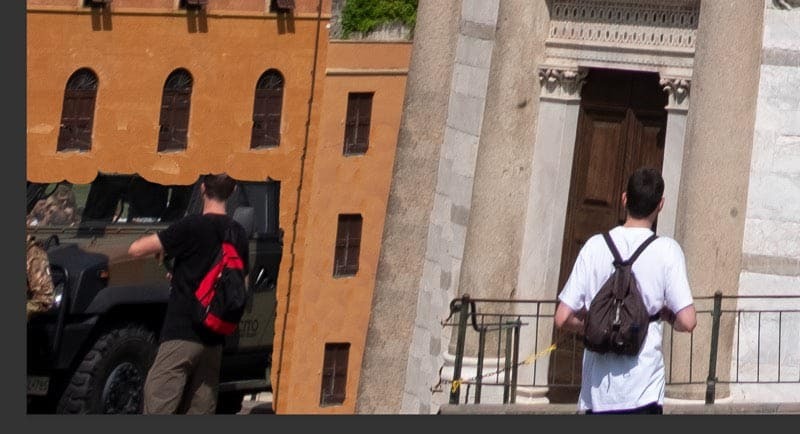 Here’s the full lower section of the photo which now shows two tourists standing in front of the tower. I’m sure you will agree this is an improvement on the original photo. Don’t try to do everything with the Patch Tool. Instead, combine it with other tools such as the Healing Brush and Clone Stamp. Plan your repairs so you know which part of an image you will repair with which tool. Choose carefully which mode you will use for your repair. Is the Normal mode best or is it better to switch to the Content-Aware mode? Always place your repairs on a separate repair layer. If you follow these points, with a little practice you will be making excellent repairs using the Photoshop Patch Tool.